Happy Wednesday! Welcome to Week 5 of the City Play Mat. This week includes Rows 77-85. Just a reminder – The City Play Mat project will run a little different than our previous projects. In the past, we released individual panels. At the end, all the panels were sewn together to make a beautiful masterpiece. If we released this project in panels, the roads would have ridges in the middle of them. We didn’t care for that particular look with this CAL. We will instead be working one big piece for a smooth finish. We divided the project into pixels (individual C2C squares). Each week we will release a certain number of pixels/rows. In the beginning, the rows are short so there will be several rows released. As we progress to the longer rows, there will be fewer released to compensate for the number of pixels in each row. The goal was to break it up and make it attainable! Download the City Play Mat Week 5 chart. 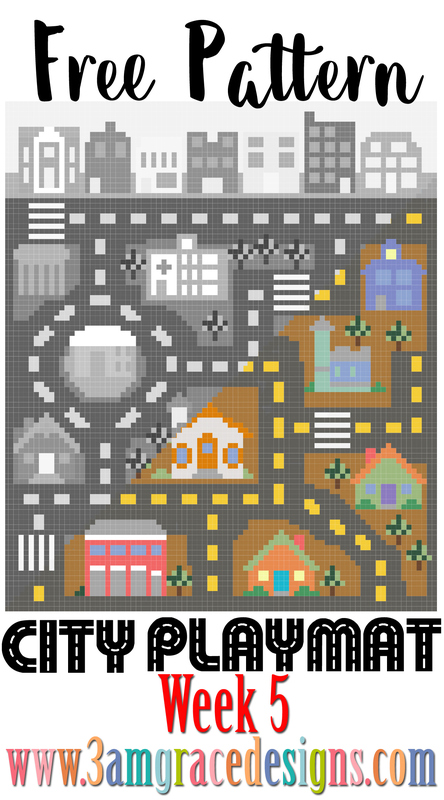 Download the City Play Mat Week 5 written instructions. Be sure to sign up for our Newsletter to receive notifications each week. You are also welcome to join our Facebook group to share your progress and enthusiasm! We are excited to share our project with you! See you next week!